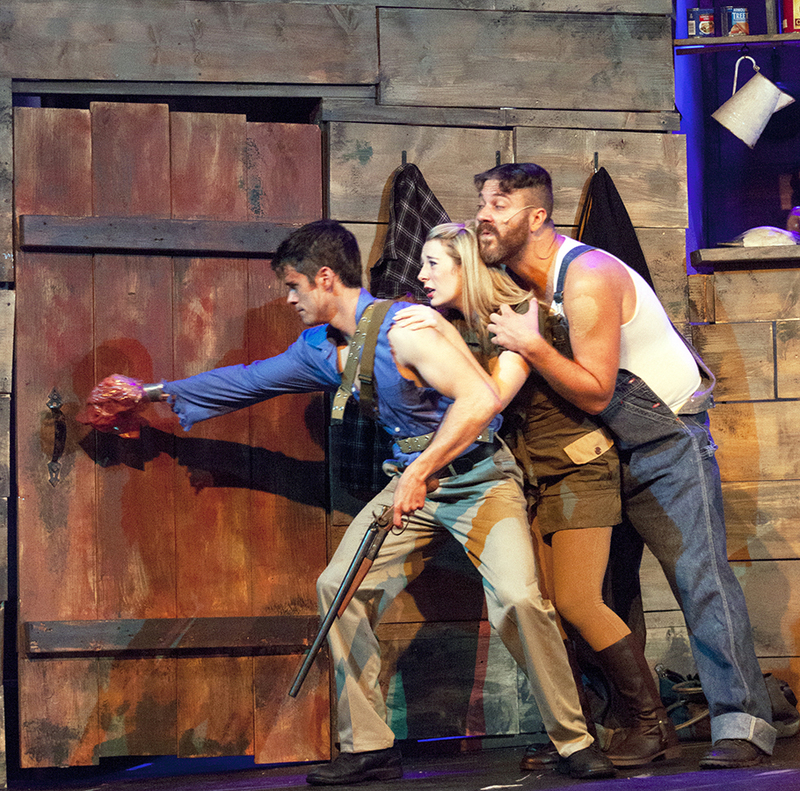 When you’ve got a proven hit and Halloween is in the air, why not bring back a revival of “Evil Dead-The Musical?” So thinks Stray Dog Theatre and we, the audience, agree. Not officially zombies, but rather Candarian Demons, they provide the same results as they stiff-walk their way around a bloody stage after being shot, chain-sawed and otherwise unsuccessfully “killed” by our hero. In an effort to update, they might consider calling them the Kardashian demons but I think that reality program may already give “Evil Dead” a run for it’s frightening life. 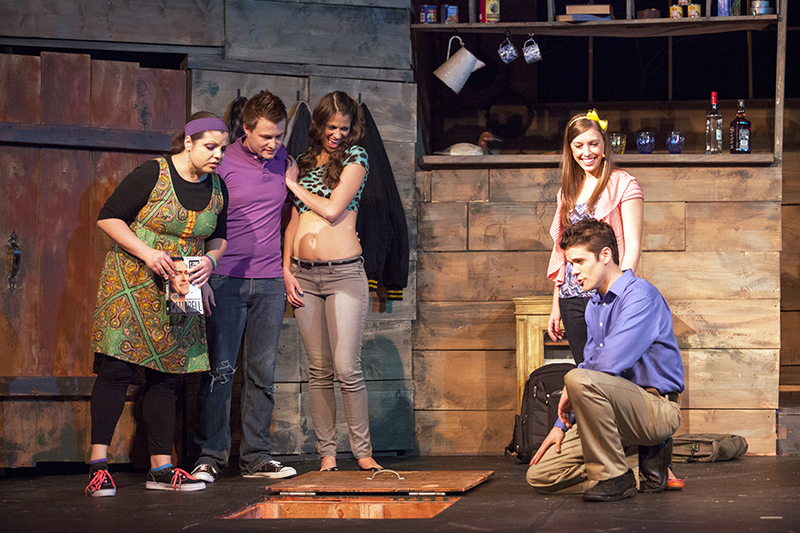 The other members of the “five teens breaking into a cabin in the woods-what could go wrong?” scenario include C.E. Fifer as Ash’s best friend Scott and his newest girlfriend, the clueless Shelly- given a wonderful performance by Angela Bubash. When the cabin owner’s daughter arrives with her boyfriend and a mountain-man guide they hire to get them there, more laughs and a lot more blood ensues. Brittany Kohl is hilarious as the preppy young blonde, Annie, looking for her father. When Ash eventually disposes of her boyfriend, she quickly latches onto him and reveals her penchant for hopeless men with the hilarious trio, “All The Men In My Life Keep Getting Killed By Candarian Demons.” As her boyfriend, Ed, Michael A. Wells is obviously “whipped” by the dominant Annie but gets a chance to shine with his specialty number, “Bit-Part Demon.” But just as he is about to rise above that status, he gets summarily shot down with cane in hand, denying him his big finish. Zachary Stefaniak is nothing short of brilliant as the backwoodsman, Jake. A big man, he surprises with his dancing prowess and his strong singing voice and gets the best gig of the evening by showering the “splatter zone” in the audience when he finally meets his demise. Rounding out the cast is Jeff Loeffler as the spirit of Professor Knowby who gets in on the fun of the multi-level finales. It’s all played out with the help of the great band featuring Chris Petersen as musical director and keyboardist along with Adam Rugo on guitar and banjo and Bob McMahon on percussion. The Nathan Marshall set design is effective and handles some of the blood-letting in surprise fashion while Tyler Duenow’s lights enhance the creepy atmosphere. Jamie Lynn Marble’s choreography is appropriately funny and effective while Alexandra Scibetta Quigley’s costumes handle the wear and tear of breaking away and getting bloody quite nicely. Director Justin Been brings it all together in fine fashion with an emphasis on camp. You’ll find yourself laughing at the silly situations and outrageous lines along with the raunchy lyrics and wonderful make-up effects created and realized by Sarah Castelli. No brain matter was harmed during the performance (with the possible exception of the audience) but it’s one big trip through every horror film you’ve seen with all the cliches and more of the fun. 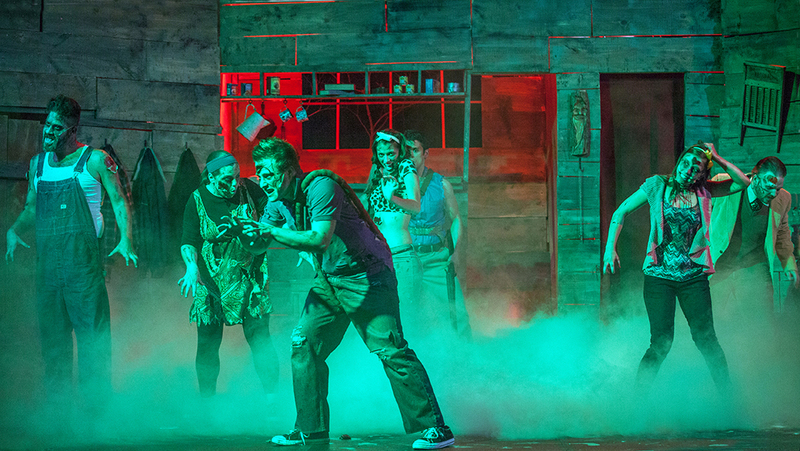 “Evil Dead-The Musical” runs at Stray Dog Theatre through November 2nd. Contact them at 314-865-1995 or at straydogtheatre.org for tickets or more information. This entry was posted on October 11, 2013 at 9:43 pm10 and is filed under Uncategorized. You can follow any responses to this entry through the RSS 2.0 feed. You can leave a response, or trackback from your own site.